This Green Toys Dump truck is great for outside and indoor play and is the most energy efficient vehicle on this planet! This superb truck is great for loading with objects and transporting to its desired destination. 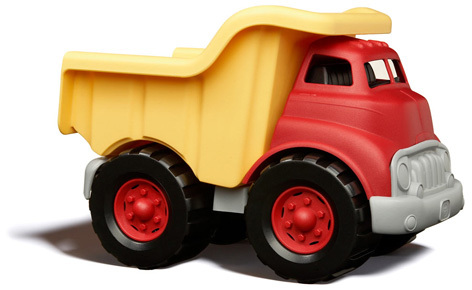 The colourful dump truck is made from 100% recycled plastic milk containers and designed to be durable and sturdy. Made in the USA from 100% recycled plastic milk containers that save energy and reduce greenhouse gas emissions. Perfect for home, classroom, outdoors, or the tub. No BPA, PVC, phthalates, or external coatings. Meets FDA food contact standards. Dishwasher safe too. Colour combinations may vary. Please tell us what you think of the Green Toys Dump Truck by Green Toys and Bigjigs.